Weston Metal Fencing is perfect for any property owner looking to add security to the boundary of their home. 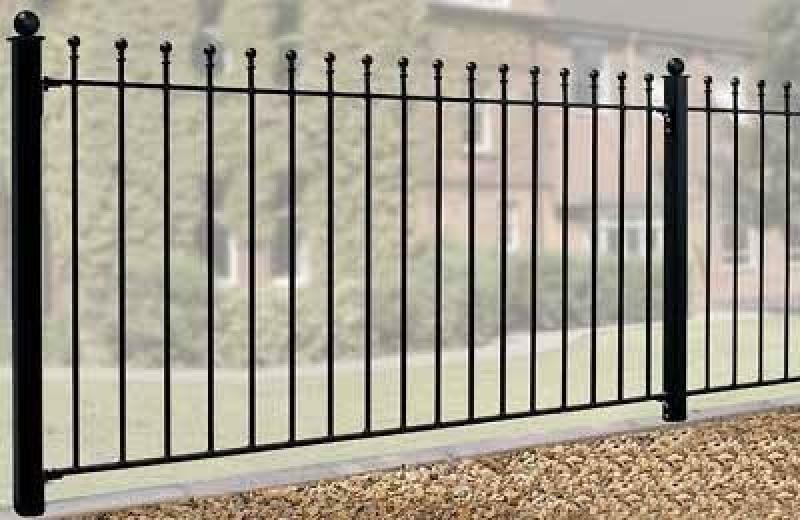 Featuring ball top finials along with a solid steel framework and infill bars constructed from zinc plated materials these metal fence panels will provide many years of enhanced security benefits at an amazing low price. Metal fencing is suitable for any home and garden. Constructed from zinc plated components to ensure great levels of protection against the elements. Weston metal fence panels feature 25mm x 8mm frames and 12mm infill bars. Please note the Weston metal fence design is not supplied as standard with any fittings. These must be purchased separately here. Looking for help ordering Weston metal garden fencing? For friendly impartial advice please contact Garden Gates Direct on 0844 804 5577 or email us using the enquiry form and we will be pleased to provide assistance. Alternatively for answers to common queries you may have before placing an order take a look at the ordering guide and frequently asked questions. Weston metal fence panels are available to order complete with metal posts as a means of support. If these are required please choose from the following options detailed below.